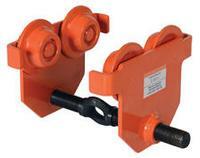 These trollies have been designed to quickly install on virtually any S and H type I-beam. 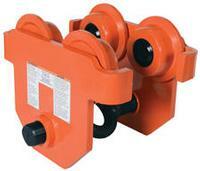 The width of the trolley is adjusted by rotating the center rod with lifting eye clockwise or counterclockwise. 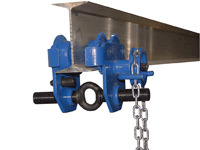 Once hoist (not included) is attached, center rod cannot be rotated which prevents trolley width from accidentally changing. Choose either plain trolley or geared trolley. 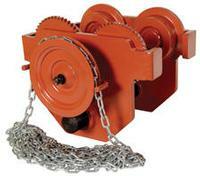 Geared trolley is ideal for use when precise positioning of the trolley is required. 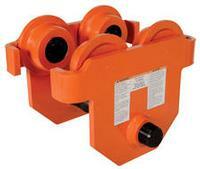 The trolley includes four rollers with sealed bearings for long life. 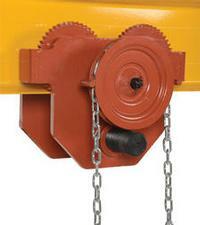 A lifting eye is located at the bottom of the trolley for attaching a hoist (not included). Steel construction and painted finish. Height is measured from the bottom of wheel to bottom of hooking eye.